Columbian Autocar Corporation, headed by their President Ms. Ginia Domingo, lauched the all-new 2013 Kia Carens Philippine reveal in an exclusive event held in Taguig, Bonifacio High Street Central. Kia Carens is a compact designed and engineered MPC with sleek aerodynamics and cab-forward design. As such it blends contemporary and distinctive exterior styling with a fresh and trendy interior. The top of the line all-new Kia Carens 1.7L EX A/T variant that comes with seven-seater capacity plus amenities that would delight even the pickiest of passengers. This third-generation MPV is fitted with a 1.7L diesel powertrain, mated with a 6-speed manual transmission for the LX variant and a 6-speed automatic transmission for the LX and EX variants. Other features: Cornering Lamps, Roof Rail (EX), Panoramic Sunroof (EX), Rear Spoiler, Paddle Shifts (EX), Glovebox cooling (EX) The top of the line all-new Kia Carens 1.7 EX AT is priced at PHP 1,480,000, and is available in Clear White, Galaxy Brown and Ebony Black. The Kia Carens 1.7 LX M/T and Kia Carens 1.7 LX A/T MPV units are available in Clear White, Bright Silver, Camden Beige and Galaxy Brown. Kia Carens 1.7 EX A/T comes in Clear White, Galaxy Brown, and Ebony Black. 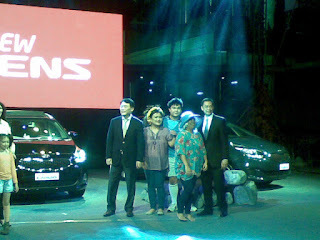 Guests were able to test drive the new Kia Carens unit. Family-oriented activities such as kiddie football clinic was conducted much to the delight of the onlookers as well.